← # LUCMICHEL. NET/ AVIS AUX AFRICAINS ET AUX AUTRES : LA FRANCE DE MACRON, C’EST AUSSI CA ! Les relations se dégradent entre Londres et Moscou. Pas une nouveauté puisque les deux pays sont en froid depuis l’asile accordés dans la décennie précédente aux opposants russes (poursuivis pour des délits criminels en Russie) (“Londongrad”) et aux islamistes tchétchènes(la version Asie central-Caucase du “Londonistan”). Le Brexit, parrainé par Trump, a relancé la « relation particulière » entre les « cousins » anglo-saxons (1). Et Londres se positionne en avant-garde de la politique agressive anti-russe de Washington. Reste que ce qui est nouveau, c’est le ton. La propagande agressive grossière, qui était jusqu’ici la marque des quotidiens britanniques (presse de caniveau), est aujourd’hui le ton du gouvernement britannique, comme le ‘UK State Secretary for Defense’, Gavin Williamson. L’affaire est prise très au sérieux à Moscou. Voir les officiels de haut rang russes qui lui ont répondu. 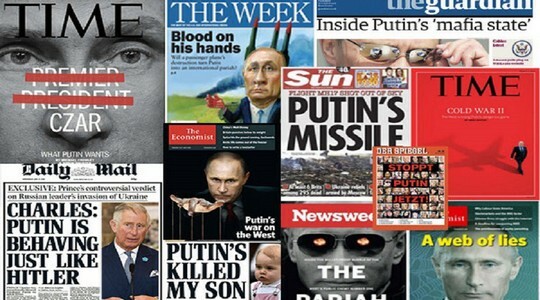 Mais surtout la publication par le ‘Club Valdai’, le Think-Tank de Poutine, d’une réponse intitulée « Quels mensonges se dissimulent derrière les avertissements du Royaume-Uni sur la Russie ? » (2). Relations are deteriorating between London and Moscow. Not a novelty since the two countries are in cold relation since the asylum granted in the previous decade to Russian opponents (prosecuted for criminal offenses in Russia) (“Londongrad”) and Chechen Islamists (the Caucasus-Central Asia version of the “Londonistan”). The Brexit, sponsored by Trump, revived the « special relationship » between Anglo-Saxon « cousins » (1). And London is at the forefront of Washington’s aggressive anti-Russian policies. RUSSIAN HIGH-RANKING OFFICIALS WHO ANSWERED TO UK STATE SECRETARY FOR DEFENSE GAVIN WILLIAMSON. Still, what is new is the tone. Aggressive propaganda, hitherto the hallmark of British newspapers (gutter press), is now the tone of the British government, like the UK State Secretary for Defense, Gavin Williamson. “If you had spent the past few weeks in the United Kingdom as a visitor from outer space, you could have been forgiven for thinking that Russian barbarians were at the gates. From land, sea, and air – we were told by the sort of people who ought to know – that the country was at risk from imminent or long-term Russian attack. Forget about rising crime, terrorism or even Brexit, the more urgent threat came came from Russia, or so members of the defence and security establishment told us. “First up was the country’s most senior military officer, Air Chief Marshal Sir Stuart Peach. Addressing the Royal United Services Institutes, one of London’s leading defence think-tanks in mid-December, the Chief of Defence Staff warned of what he said posed a “new risk to our way of life”- the possibility that Russian submarines could cut undersea communications cables, severing inter-continental data and phone links. Any disruption, he said, would « immediately and potentially catastrophically » hit the economy. “But it was Sir Michael’s successor as defence secretary – in the job for less than two months, whose intervention produced some of the most alarmist headlines. Gavin Williamson used an interview with the pro-Conservative paper, the ‘Daily Telegraph’, to warn that Russia was making efforts to probe the UK’s cyber defences and had plans to attack British power stations and grids in the event of a conflict. Russia’s tactics, he said, were to create « domestic and industrial chaos » in the UK and to « damage its economy, rip its infrastructure apart, actually cause thousands and thousands and thousands of deaths » – then wait for the UK’s response. “Williamson’s remarks produced a dismissive tweet from the Russian Embassy in London, and a spokesman for the Russian defence ministry compared them to a Monty Python sketch. But this barrage of official UK alarm about Russia over such a short period poses a natural question – why? “Before hazarding some answers, it is worth observing that the difference in recent weeks has been in the frequency of the warnings and their urgency, rather than in a complete change of tone. After all, the Prime Minister made the supposed Russia threat a theme of her annual foreign affairs speech in November, and as defence secretary, Sir Michael Fallon raised regular alerts about Russia. Still, the virulence of the language and the urgency of the tone over recent weeks have been striking – so what’s up? “Let’s start with the obvious: money. Magnifying the Russia threat is a traditional and easy way for the military to try to drum up support for maintaining, or even increasing, defence spending, at a time when the government of the day is looking for savings. “In this case, protecting the military budget has also become bound up with the reputation of the new defence secretary. Gavin Williamson’s appointment was not without controversy. It was pointed out at the time that he had no previous experience of defence or security, had never served in the military and had only been appointed because he was seen as a safe pair of political hands and an ally of the Prime Minister. “Williamson may thus feel that he has something to prove – especially if, as is said, he also harbours ambitions to lead the Conservative Party. Posing as a stout advocaate for the military and the nation’s defence is a good way to curry favour both with the party mainstream and with the top brass. “But why specifically hype the Russia threat? Partly because blaming Russia carries no risk. UK relations with Russia have long been so bad that even shouting about new threats is unlikely to make them worse. “There is a contrast here with China, which tends to be treated more benevolently, despite its activities in the cyber-sphere. The has allowed Chinese investment in telecoms and a new nuclear power station that some other countries – the US and Australia for example – would probably have banned. The UK also sees China as a promising commercial partner post-Brexit in a way it does not think of Russia – even though UK companies have longstanding links with the Russian commodities sector and the UK has recently bought more Russian gas, following problems with our own North Sea pipeline. “A further explanation might be that those sounding the alarm genuinely believe that a new Cold War is upon us. As far as the military are concerned, this is strange, because military people have generally been less hawkish about Russia than politicians. They understood better than the politicians that post-Soviet Russia was a weak power and that Russia’s military sector was in dire need of modernising. Those with military experience also take, by and large, a more cautious attitude to armed conflict, because they know what is really involved. “It is unusual, then, for the likes of Sir Stuart Peach or Sir Nick Carter to speak so publicly about a threat from a particular quarter. So while worries about funding may be a large part of the explanation, could it perhaps also be that some of the furore in Washington about supposed Russian interference in the Trump election has seeped back to the UK via intelligence channels? Or, to make a similar point in a different way, might there be circles in the UK government who share the concern of their counterparts in Washington about a possible Trump rapprochement with Russia – and want to stop it before it starts? “In that event, the warnings about Russia could be one side of an argument being conducted on both sides of the Atlantic about Russia policy, with the cold warriors wanting to get out their message loudest and first. The results, if any, of Boris Johnson’s pre-Christmas trip to Moscow are hard to divine, but a case can be made that he and Sergei Lavrov established a reasonable rapport, and that Boris – who is at heart a foreign policy realist, sees benefit in improving relations with Moscow as Brexit approaches. “At which point it might be pertinent to ask how far all this alarmist talk about a new Russia threat is really resonating. And the consoling answer, in my judgement at least, is not very far. It is not just Russian officials and social media users mocking the panic, but many Britons, too. The warning about Russians planning to cut undersea cables was countered by reports that fishing boats regularly damage cables without the world coming to an end. And why, many responded to Sir Nick Carter, was the UK wanting to equip itself to take on Russia alone, when it had the might of the Nato alliance behind it, that outspent and out-armed Russia many times over? “Even top experts have their misgivings. In a recent talk to another London think-tank, the former head of MI6, Sir John Sawers, cast doubt – implicitly – on the premise of a grave new Russia menace. In a half-hour presentation about current threats, his first mention of Russia came near the end, when he spoke about the cyber potential of “Russia and others”. Some Foreign Office diplomats were said to have condemned the new defence secretary’s alarmist tone. (2) See WHAT LIES BEHIND THE UK’S WARNINGS ABOUT RUSSIA? This entry was posted in # ACTU / BREAKING NEWS, # ARTICLES BY LANGUAGE, # VIII. Luc MICHEL/ GEOPOLITIQUE & IDEOLOGIE/ GEOPOLITICS & IDEOLOGY, # XI. Luc MICHEL/ NNK - NEUE NATIONALEUROPÄISCHE KULTUR, * English, * EODE, * Français, * LM/ Geopolitics/ Greater-Europe & Eurasia/ Grande-Europe & Eurasie and tagged Cold War 2.0, guerre froide 2.0, impérialisms américain, Luc MICHEL, NATO, OTAN, Royaume-Uni, Russia, Russie, UK, US imperialism, USA, Washington. Bookmark the permalink.